B. Dolores Thompson. “The Circle Of Distinction Welcomes Catherine Harris,” Jamestown (NY) Post-Journal, 10 March 1984. The New York state blue and yellow marker proclaims the site an important part of Jamestown’s heritage. The unprepossessing house standing on the property belies its history and its role in an international network which provided freedom for an enslaved people. The original structure, much more modest than the current enlarged one, served as one of the stations along the Underground Railroad. Its owner was Catherine Dickes Harris, a freeborn Black woman. Her courage and compassion have brought her recognition in the past. This week, the American Association of University Women adds its accolades to Mrs. Harris who risked her own life to help others achieve freedom. The week of March 4-10 has been declared by the U. S. Congress as National Women’s History Week. The celebration coincides with International Women’s Day, March 8, which was proclaimed at the turn of the century to recognize the contributions of women to the labor movement and also the international connections among all women. The observance of Women’s History Week began in Sonoma County, California in 1978 and quickly spread across the country. By 1981, the United States Senate had deemed the observance worthy of national scope and 24 governors and state legislatures had issued proclamations for this purpose. The following year, the U.S. Congress officially declared the first week in March as National Women’s History Week. In 1982, the Jamestown branch of AAUW also recognized the need to honor women’s role in shaping the history of the United States and of our own community, a role which has been largely ignored by historians. Under the chairmanship of its cultural chairman, B. Dolores Thompson, who is the City of Jamestown Historian, the branch established the Circle of Distinction. Every year as part of the national celebration, a local woman who has made a significant contribution to local history or to the history of women will be selected for inclusion in the Circle. 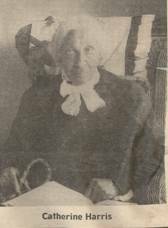 The first year, the branch selected Calista Selena Jones, a 19th century Jamestown educator. Miss Jones had demanded – and ultimately did receive – equal pay for equal work, unheard of in the mid 1800s. Offered the position of a dismissed male, she accepted on the condition that she receive the same salary paid to him. The horrified Board of Trustees initially refused, but were finally forced to relent, and Miss Jones became the first woman in Jamestown to receive a dollar a day for her work. Last Year, Katherine (Kate) Stoneman was honored for opening a door, in 1966, previously closed to women in New York state. Born and raised on the family farm in Lakewood, Miss Stoneman spent her adult years in Albany where she taught at Albany Normal School (now SUNY Albany). She was also very active in the suffrage, temperance, and world peace organization movements. During this time, she studied law in her spare time, and passed the oral and written bar examinations in 1886. Denied admittance to the Bar because she was a woman, she marshaled her forces for a lobbying assault on the State Legislature. Within one day, she had secured a special act from the Legislature which admitted qualified women to the Bar. Twelve years later, Miss Stoneman became the first woman to graduate from Albany Law School. This year, Catherine Dickes Harris joins Miss Jones and Miss Stoneman in the Circle of Distinction. Serving on the selection committee for AAUW this year are B. Dolores Thompson, chairman, Jean Brustrom, Priscilla Kibler, and Ida Knight. Catherine Dickes was born June 10, 1809 on a farm near Meadville, Pa. At age 19, she married her husband, an Erie, PA man. They came to Jamestown in 1831 and, according to one account, were the steadily growing community’s first black citizens. They built a small house at what later became 12 West Seventh St. The structure grew over the years, additions being built as necessity dictated. Today’s house bears little or no resemblance to the original. However, the role played by that original little house is not forgotten. Although only 16 feet in length, it is maintained that Mrs. Harris could hide as many as 17 runaway slaves at one time in the attic. Mrs. Harris’ obituary recounts that she was “tall and slender with a refined and intelligent face. She was a woman of a peculiarly sunny and happy disposition, generous, thoughtful and unselfish.” She was well-known in the community for her skills as a natural doctor, nurse and midwife. During the years preceding the Civil War and the abolition of slavery, she harboured untold numbers of runaway slaves, furnishing food and medical care as well as refuge. Defying the Fugitive Slave Law, she risked fines of $1,000 and up to six months in prison to help her fellow man. 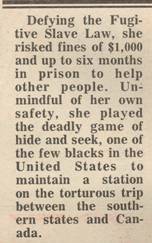 Unmindful of her own safety, she played the deadly game of hide and seek, one of the few blacks in the United States to maintain a station on the torturous trip between the southern states and Canada. In 1881, 17 years after the close of the Civil War, the little house served as the site for the birth of the A.M.E. Zion Church. Eventually, the home became the church’s parsonage. In appreciation and in honor of Mrs. Harris’ contributions to the history of Jamestown and to blacks of generations past and present, the church erected a monument marking her grave in Lakeview Cemetery in March 1976. Local officials and out-of-town officials of the AME Zion Church attended, with the Rt. Rev. Herbert Bell Shaw of Wilmington, N. C. presenting the dedicatory address. Catherine Harris died Feb. 12, 1907, nearly 98 years of age. She had been active up to the last few weeks before her death from pneumonia. Her daughter, who had contracted the same illness, preceded her in death by a few hours. As the nation begins the celebration of National Women’s History Week, the Jamestown Branch AAUW urges Jamestown area residents to join with it in saluting the many women, known and unknown, who have helped shape the community we today call home. We proudly welcome Catherine Dickes Harris to the Circle of Distinction!